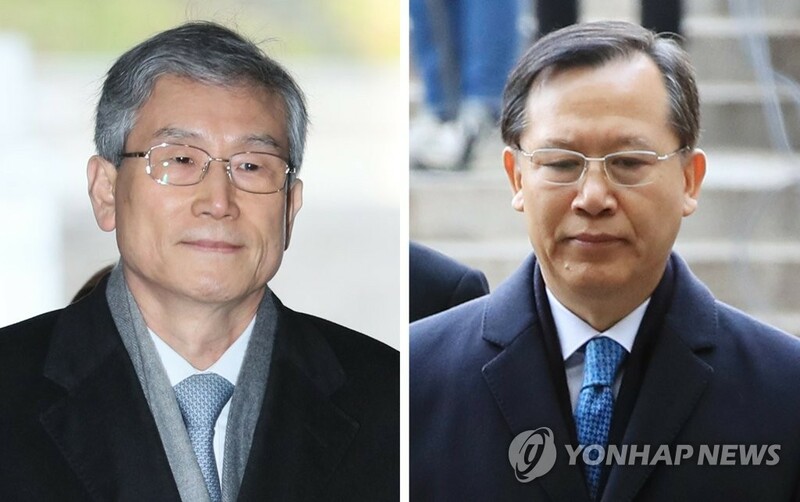 SEOUL, Dec. 7 (Yonhap) -- A Seoul court on Friday denied prosecution requests for warrants to arrest two former Supreme Court justices in connection with a massive power abuse scandal in the judiciary. The Seoul Central District Court made the decisions on retired Justices Ko Young-han and Park Byong-dae, citing low risks of them fleeing and that the charges against them were not substantiated enough to require pre-indictment detention. The two former chiefs of the National Court Administration (NCA), the top court's governing body, are accused of involvement in then Supreme Court Chief Justice Yang Sung-tae's plans to interfere in trials in order to lobby the presidential office of then President Park Geun-hye. Prosecutors filed for the arrest warrants Monday on a slew of charges, including abuse of power and dereliction of duty. The court held review hearings on the warrants Thursday. Prosecutors believe that Yang sought to establish a separate court of appeals and needed presidential approval to push it forward. Prosecutors suspect Yang instructed his officials, including Ko and Park, to exert pressure on presiding judges to deliver verdicts in Park's favor. They have denied any wrongdoing. Among the trials in question are a damages suit filed by Korean victims of Japan's wartime forced labor. Prosecutors believe Park Byong-dae deliberately put off the case to curry favor with the former president as she was seeking amicable relations with Tokyo. He is also accused of interfering in other trials whose rulings potentially held high political significance for the Park administration, such as a case involving a progressive teachers' union and a corruption trial of a former spy chief. Ko is accused of covering up an appeals court judge's wrongdoing in the southeastern city of Busan in 2016 because he had close ties with a then presidential secretary and Yang needed their connection to lobby the presidential office, Cheong Wa Dae. Ko served as NCA chief from February 2016 to May 2017 and retired in August this year. Park was his predecessor. Kim, Putin begin to build rapport amid uncertainties in ties with U.S.